Yes, I’d said no more Mustang, but as no one listens anyway, who cares. The Chevaliers du Vent took their Annapurna Mandala Trail to Upper Mustang in 2012. Fabien Brusson‘s documentary about this multi stage has just been uploaded to youtube, and anyone who has run the same same but here and there a bit different trails is going to enjoy watching it. Phu Dorjee Sherpa (and Upendra Sunwar Rai, and Manikala Rai) are prominently present, as are chevaliers du vent stalwarts Bruno Poirier, Pascal ‘le sherpa blanc’ Beaury, and Jean-Marc Wojcik. My Aussie friend John Cuthberson came fourth, how he survived all that French is anyone’s guess. 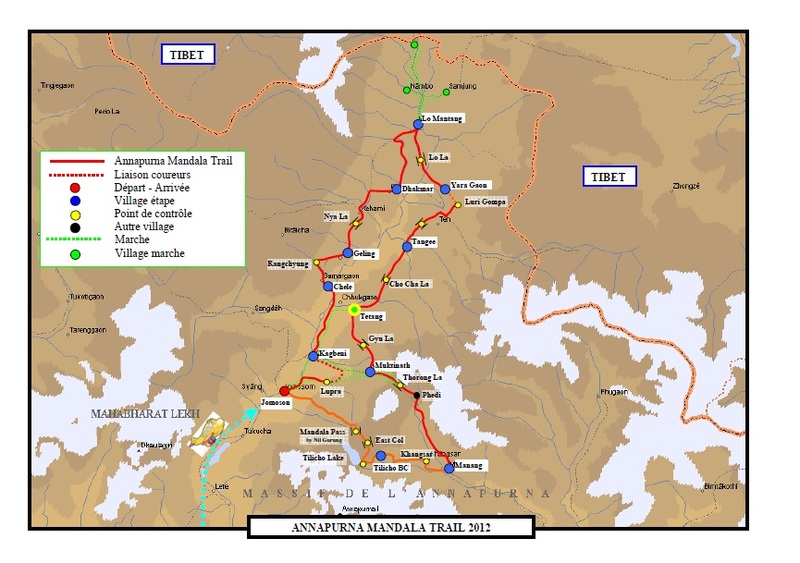 This is the map of the course (click on it for a slightly larger version); but having reached Muktinath, the organizers altered the intended ambitious crossings of the Thorong la to Manang and then the Tilicho La to Jomosom (the exhaustion from the earlier stages and the snow conditions expected on the Tilicho trail were the stated reasons). Carrying all one’s gear and a 40k stage from Tangge to Muktinath obviously made for a harder event than the 2014 Mustang Trail Race. This entry was posted in (trail) running, Mustang Trail Race 2014 and tagged Annapurna Mandala trail, Fabien Brusson, Mustang Trail Race. Bookmark the permalink. Very jealous of even the potential to do these races and travel. Ready for retirement for me I guess!